Tredie aftapning i The Keystones serie fra Highland Park er på vej. Aftapningen har fået navnet Quercus, altså Egetræ og i denne forbindelse brugt til whiskyfade. 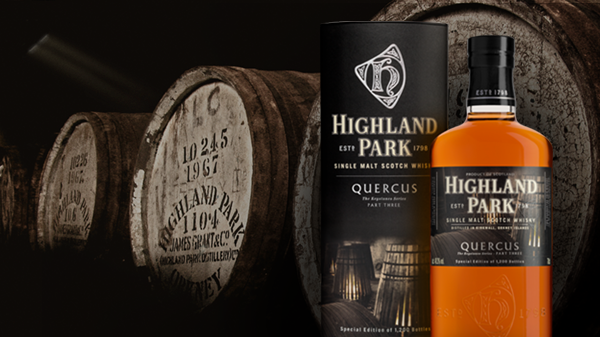 QUERCUS is named after the species of oak we use to make our casks and explores the impact that our casks have on the character of our whisky. It’s fair to say that we’re obsessed with wood and casks at Highland Park – a little ironic given the lack of trees in Orkney! We carefully select European and American Oak trees, cutting the wood into staves at precisely 45° to make it harder for any spirit to escape. The staves are shipped to Jerez in southern Spain to be made into casks, filled with Oloroso Sherry and left to mature for two years before being emptied and shipped back to us in Orkney." I følge Highland Park, så kommer whiskyens karakter i 60% til 80% fra fadet og i dette tilfælde fra en fad hvor der har været lageret sherry på først. Der kommer 1200 flasker af denne aftapning. Sælges via lodtrækning og sidste tilmelding var den 22. november 2017.